I found this grasshopper a little lethargic; due to a little cold snap. I think this is why he was so cooperative. I converted to black and white, in Picasa. I also adjusted sharpness. 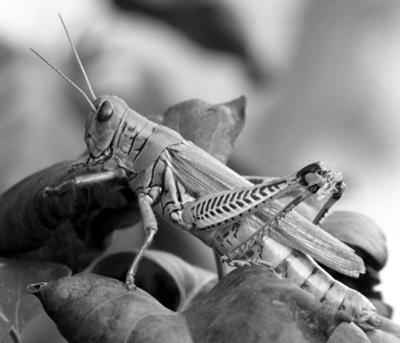 Insects are unusual subject matter for black and white photographers. They are often colourful little creatures and so the obvious approach is to take the photo in colour. But it's nice to see that Terry followed out number 1 black and white photography tip – photograph in colour and then convert to black and white. This gives you the option of the colour photo (just in case the black and white version doesn't work out! ), but also gives you more control over the black and white effect. Click to read more about the science behind black and white photography. The thing that does make insects 'work' in black and white is the patterns. Terry's little grasshopper has some great markings creating some nice patterns that convert really well to black and white. Thanks Terry for the submission. Want to learn some powerful photography techniques? 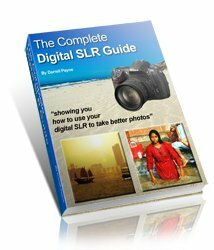 Get our recommended eBook, and start shooting like a pro! Join in and write your own page! It's easy to do. How? Simply click here to return to black and white photography.